This week, Falck participated with two teams in the European EMS Championship - a competition that is part of EMS2018. Our two teams from Denmark and UK competed against 10 other highly competent teams. Hakim Dungerwalla, Bradley Osner, and Charles Boshoff who represented Falck UK in Copenhagen went head to head against some of the best EMS teams around the globe in the EMS2018 Championship this week. We commend the competing Falck teams who faced extremely intense challenges when they were presented with two scenario-based events viewed by 30-40 EMS clinicians including Doctors,Nurses and Paramedics all critically analysing every movement. The feedback received from the judges were consistent for both scenarios stating the team leadership, communication and teamwork between the group was extremely strong and effective, which of course was supported by exemplarily patient care and management in challenging circumstances. Unfortunately even after the strong display in the group stages we missed out on the final alongside some strong competition. 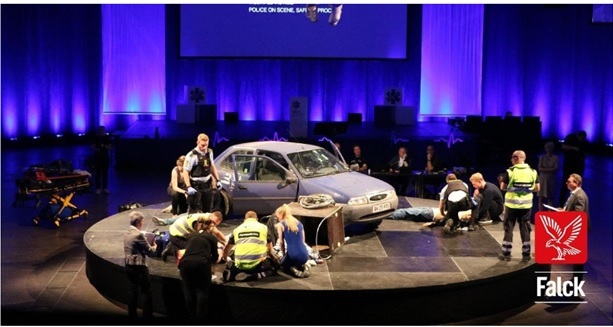 Falck Denmark, East Midlands NHS Ambulance Trust (EMAS), and the EMS Doctor team Pre-hospital Central Region (Denmark) fought it out in an exciting final which was eventually won by EMAS. Thank you to our competing crews from Falck UK!